When people hear about a pirate slot game, of course, they imagine evil men with patches on one eye, a wooden leg and a parrot on the shoulder, sailing on huge boats with skulls on the flags that wave. If the game is about cowboys, there will be horses and men in plaid shirts and big guns in the waist entering taverns and having duels in empty streets covered in dust. But if we talk about games of gold prospectors we will think of great men with helmets that have lights, with beards, full of dirt and grease, and that will be armed with ropes and big spikes breaking the ground, but surely we never imagine that they could include any beautiful blonde with large curves and a tight plaid shirt, and that also has its own mine and much less assume that the main characters are two old fun that is interested in both the attractive lady and gets gold. 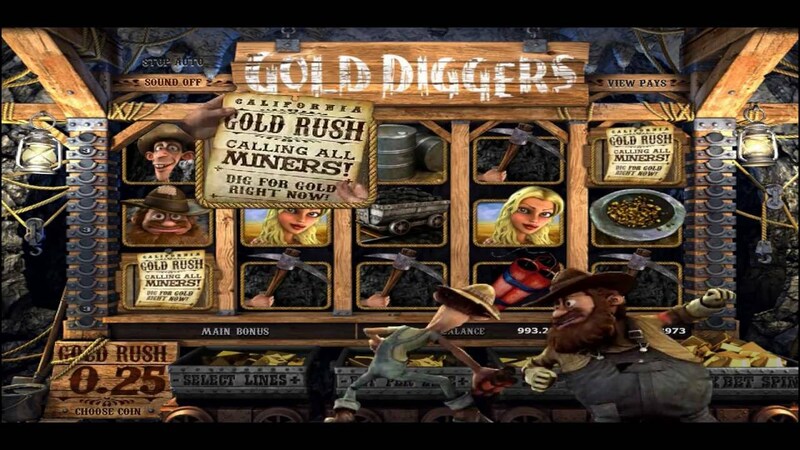 In Gold Diggers slot, the theme of the gold mine is combined with the female interest in obtaining gold easily. As the name says, this online slot is about a gold mine and its extraction, giving the player the opportunity to be rich by obtaining gold and also have fun in the process. Gold Diggers is a machine that consists of five reels and that pays in 30 lines during which you can get many free spins, bonuses, bonus symbols and also jokers, enough reasons to stay stuck in this lucrative game.We already know that this game takes place in a mine, but not the story behind it, because there is always a story to be able to fulfill a goal, which in this case is to win a lot of gold. It is about two brothers who live clandestinely, and who are determined to find gold, and only in that they spend time, until they are achieved with the curves of a young and beautiful blonde who supposedly finds herself in the task of digging gold as well as the brothers, but that really his intention is to seduce one of the two brothers and thus stay with all the gold.And exactly the mission of the players is to find all that gold before the blonde or the brothers keep it. As in all mines there are dynamites that explode and a lot of sweat, but they are necessary to achieve great rewards. As with all the slot games developed by Betsoft, Gold Diggers is incredibly exciting and entertaining, it has a creative nature like all the interfaces of Betsoft games, that those who already know them know that what we say is true, but if you still do not know them with Gold Diggers you will notice that these slots count with consoles quite easy to learn. In the same way you will notice that each game developed by Betsoft has the game information as detailed as possible, so that the players understand better the forms of the payments and the bonuses, especially when they have no experience in slots games, and they can thus know how to make the bets and in turn to obtain big profits especially when they come across the bonus rounds. When a player does not understand how to play, how much each symbol pays, or how to get free spins, how much he can win and the best way to do it usually quits, even if the slot is very nice, and that’s definitely not the case with games of Betsoft. We already know that Gold Diggers is a game of Betsoft, now we go with the symbols that we will find when we start playing: The main or most iconic is the Oil Barrel, a peak, of course, the Dynamite, a mining cart loaded with gold in nuggets, the lantern, the beaver, the beautiful blonde and the miners brothers are also included in the reels. Among the main features of Gold Diggers are the scatters and bonuses that are included. The graphics are excellent, and its thematic music quite catchy, with which the player is transported to the time where everyone had the so-called fever for gold in California of another time. There is one that perhaps represents a disadvantage for some players is that this slot is not a progressive game. And as for the bonuses, which are less than other Betsoft slots are quite lucrative, which include a bonus for clicks and second screen. Gold Diggers makes good payments on bonuses, which are also numerous. When there are three or more Dynamite symbols there will be an explosion, and the other symbols above will return to their place. If you hit 3 Beavers then another function will be activated to click on the Beaver.In order for the bonus found on the secondary screen to be activated, three ads must appear, and in turn, credits that are hidden in the excavation will be revealed in three places that will be found below. Between 0.02 and 0.050 is the oscillation that has the value of the currency in this game, being the maximum amount to a bet of 125 credits that would be applied to five credits per line. When you obtain five symbols of the bearded miner on the reels, you will earn up to 500 points per coin. As you can see this game is low stakes, which makes it affordable for many who prefer not to risk much. By now you should know that Betsoft online games are quite easy to use and that all buttons used to select the value or amount of the coin, bets or turns are in the bottom of the golden car and stand out clearly. As for the bet with which he is playing, the balances, as well as the credits that he has obtained, are clearly highlighted in the bottom where the groove of the video is. If you want to toggle the music there is an icon that says Sound On located above the banner of the name of the game.Now that you know a little more about Gold Diggers, you will surely be encouraged to try it, these miners will make you enjoy hours of fun and lots of gold. As a last detail, we tell you that you should not miss the jumps of excitement that the miners do every time you make winning combinations. If you like adventures this slot is your thing, even though it is not a machine with progressive jackpots because it is still a very productive slot machine.Gold Diggers were launched in 2010, and since then it has been updated by adding new, more lucrative bonuses. Gold Diggers are a game quite remarkable especially for its sublime symbols, as well as the animation of each of the elements. If you want to enjoy a great slot experience and also get incredible profits with Gold Diggers you can be sure that you will have that opportunity, because like all the famous slot machines of Betsoft Gold Diggers you will enjoy an unparalleled gaming experience. Gold Diggers can also be played on mobile devices and do not miss a moment of the fun it provides. By now you should know that Betsoft online games are quite easy to use and that all buttons used to select the value or amount of the coin, bets or turns are in the bottom of the golden car and stand out clearly. As for the bet with which he is playing, the balances, as well as the credits that he has obtained, are clearly highlighted in the bottom where the groove of the video is. If you want to toggle the music there is an icon that says Sound On located above the banner of the name of the game. Now that you know a little more about Gold Diggers, you will surely be encouraged to try it, these miners will make you enjoy hours of fun and lots of gold. As a last detail, we tell you that you should not miss the jumps of excitement that the miners do every time you make winning combinations. If you like adventures this slot is your thing, even though it is not a machine with progressive jackpots because it is still a very productive slot machine.Gold Diggers were launched in 2010, and since then it has been updated by adding new, more lucrative bonuses. Gold Diggers are a game quite remarkable especially for its sublime symbols, as well as the animation of each of the elements.If you want to enjoy a great slot experience and also get incredible profits with Gold Diggers you can be sure that you will have that opportunity, because like all the famous slot machines of Betsoft Gold Diggers you will enjoy an unparalleled gaming experience. Gold Diggers can also be played on mobile devices and do not miss a moment of the fun it provides.